Nybbles from Albert: Want a Charge with That? Want a Charge with That? 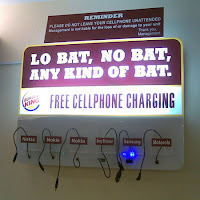 Seems like selected outlets of Burger King in Manila are offering customers free charging of their mobile phones with every order. This being in the Philippines, I'm pretty sure people will be standing beside the charging station munching on their burgers and fries while waiting for the phones to charge up. If you're not careful and blink your eyes, you'll lose your phone. Update: A colleague wrote in to say that mobile charging stations can also be found in selected McDonald's and Wendy's outlets and Ayala Cinemas.